When reading the cover of David Frango’s novel, The Quantum Enzyme Code: The Woman Who Discovered the Cure for AIDS, one cannot help pausing to gaze at the title. It stirs up a reader’s curiosity to open the book and start reading. I am glad to have had the opportunity. The novel is a futuristic science fiction story spanning the years 2020 to 2035. In an obscure rural town in Arizona, a young girl by the name of Dianna Utterson emerges as a child prodigy in mathematics and science. Raised in a plain, hardworking blue-collar family, Dianna magically embraces her faith, imagination, and passion for the hidden secrets of the Human Genome. Her Uncle, a positive role model in her life, nourishes her creativity and imagination in science. His death inspires her quest to find a cure for AIDS. Dianna, a phenomenon in Science, Molecular Biology, and Math, maintains an uplifting spiritual belief in God. It is an innocent blind faith in humanity that causes her entanglement with obsessive human greed. Dianna unknowingly faces a clever and devious student fixated on her and stealing her work. She is also confronted with underhanded pharmaceutical companies trying to acquire her work for their profit. Amid the obsession to steal and profit from Dianna’s work, Vatican ideologies clash. There is a group in the Vatican intent on suppressing and controlling the cure, and a group wanting to distribute it. The central plot of the story focuses on Dianna’s research, introducing the reader to such areas as quantum physics, molecular biology, the pathogenesis of the AIDS Virus, and DNA sequencing. Although some parts of the book may be complicated to someone with little or no scientific background, the progression of Dianna’s research is well plotted and her results, though fiction, are believable. It would have been an easier read if there were more illustrations associated with the various scientific principles. For example, illustrating Pascal's Triangle was helpful. The scientific plot is visual; illustrations would help readers with little or no scientific background. Although the scientific plot can be difficult at times for the average reader, the story is well worth the read. Many modern day issues arise pertaining to human morality and immorality, corporate and pharmaceutical greed, as well as Faith, both in the spiritual and political sense. The book is a compelling look at scientific research and the costs, both good and bad, associated with it. I would have like to have seen the Government’s role in one of the subplots. These days, there is a powerful fundamentalist influence within Government to legislate morality as they see it. It would have been interesting to see the Governments’ response to a cure for AIDS. I highly recommend this book to those with a scientific background as well as those who enjoy reading a good science fiction thriller. I also recommend the book to readers who enjoy reading thrillers embroiled in plots associated with the human condition. Bruce Huntly's novel, Fusion, is an entertaining thriller focusing on an important social, economical, and political issue - the use of alternative fuels that could considerably reduce our dependence on oil. Specifically, the author examines the use of Cold Fusion as a viable alternative fuel. The plot is action packed from start to end. The story, itself, centers on a young headstrong woman by the name of Kaylin Gordon. With possession of her late father's scientific research on Cold Fusion as a feasible alternative fuel, Kaylin becomes the target of an international plot. A group of powerful and dangerous men, eager to maintain control of the fuel industry at any cost, actively pursues Kaylin to acquire and suppress her father's research. The author takes the reader on a suspenseful and dangerous journey from Canada to the United States, to Paris, and to Zurich. Kaylin and her friends, as well as allies, Milly and Matthew, hunt down, and combat those seeking to silence Kaylin. Filled with suspense, the journey reveals many twists and turns. We think we know each character Kaylin meets, but are surprised to discover that some are not what they appeared to be. Through a series of deadly conflicts involving Kaylin and her friends, Kaylin discovers she is not only fighting to protect her father's work, but also fighting to save her own life. The forces she is up against seriously underestimate this strong willed and physically powerful young woman. The plot surrounding alternative fuels coincides well with today's concern about the high cost of oil, gas, and the damage we are doing to our environment. The book could easily be adapted for television or film. The international intrigue and suspenseful plot makes this book a real page-turner. Because of the well-written dialogue, eloquent description of the various international settings, easy to understand technical terms regarding Cold Fusion, and an intense romance, the novel is a definite must-read. In England, in the year 1847, two young boys by the name of Mark and Jack, escape from a dreadful workhouse where they are mistreated and abused. Alone in the night, the horrified children find themselves facing the terrifying unknown, Vampires. On this fateful night, both boys are bitten, but survive due to the actions of Mark, Jack's protector. The boys are taken to Ash Tree House and raised by a Pure Blood Vampire known as Ravenscroft. Ravenscroft becomes a father to Mark and Jack, and the boys become loyal brothers. As Mark grows up, he becomes disgusted with what he has become and the desire to be human overpowers him. This intense desire entices Mark to leave Ravenscroft and the vampire family. Jack, loyal to his brother, flees with him. After five years moving from town to town, with Mark feeding only when his body can no longer withstand the lack of sustenance needed to survive, they settle in the town of Thirnbridge. In Thirnbridge, Mark and Jack face the nightmarish experience of the events that unfold when their old vampire world catastrophically collides with their new world, having integrated themselves within human society. The Bitten is more than just a novel about vampires. Mark's journey to find his humanity becomes entangled with the lives of others, both human and vampire. The challenges of what it means to be human are revealed. Such human traits as revenge as justice, killing for survival, and killing to avenge those that caused harm are raised. We see these traits in such characters as Ted Hawkins, obsessed with killing the vampire that murdered his daughter, and Daniel Stewart, who wishes to wreak havoc on a society he blames for the abuse and torment he suffered as a child. In a modern day setting, The Bitten relinquishes many of the Gothic interpretations of vampires to develop a realistic account fitting of a vampire living in today's world. Human morality, the basic human instincts of survival, and the human desire to love and be loved are revealed. Through a meticulous and powerful account of life on the streets of Thirnbridge, the reader is taken into the lives of the characters, feeling the raw emotions of each character that is reflected in their surroundings. The intense description of violent killings, Mark's desire to love Lisa Jennings, and the guilt he carries, makes the novel a genuine page turner. The Bitten is a unique and captivating approach to vampire novels. It delivers an engaging look at the human consciousness, the human spirit, and challenges how we look at ourselves. Nancy shares her intensive and sometimes agonizing physical and spiritual struggle when faced with this disease. From the initial shock of finding large clumps of hair on the shower floor, to the overwhelming diagnosis, Nancy chronicles the medical and holistic treatments, as well as the emotional and physical obstacles that she fights to overcome. By revealing her most intimate thoughts, Nancy eloquently affirms the statement, "Although alopecia areata is not life threatening, it is most certainly life altering." We become aware of how much society values hair, and when one loses it, the emotional loss is as significant as the physical loss. One notable theme throughout the book is that of our natural world, particularly the change of seasons. Loss and rebirth in nature entwines itself with Nancy's physical and spiritual being, and with that comes inspirational hope. How others react to Nancy's hair loss shapes her internal struggle. Not only do her present interactions with others affect her, but her childhood experiences with her hair are discussed. Through comical reflections we see how the importance of hair is instilled in all of us at a very young age. Nancy's humor is an important defense against this disease. We see this humor when she talks about her wigs affectionately known as "the girls." A disturbing statistic about alopecia areata is revealed. One study indicated that "forty eight percent of alopecians had considered suicide." By sharing such a personal struggle, Nancy shows us that through perseverance and self reflection, one can find the strength to live with the disease. The journey of shock, denial, fear, anger, and depression, is a journey worth taking. 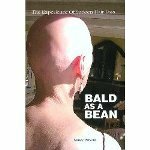 Not only do I recommend Bald as a Bean, The Experience of Sudden Hair Loss to those suffering from alopecia or hair loss due to a treatment such as chemotherapy, but as well, to those who enjoy reading true stories about the triumph of the human spirit. The Little Book About Big Success is a brilliant handbook designed to help individuals reach success. By analyzing ourselves, which includes a thoughtful look at our past, present, and future, author Charles Holmes challenges readers with the thought provoking question, "Are you really happy?" The reader is taken on a journey of self exploration. Along the voyage, certain steps are revealed that are key to achieving happiness. The author takes a stand against what we have been taught since childhood regarding what it means to be successful. That deep-rooted message: Happiness means acquiring extreme wealth and surrounding ourselves with superficial goods. The author takes us on a different path to success, one that leads to true happiness of the self, or in other words, the spirit. A success goal that emphasizes faith and family is as much a necessity to happiness as acquiring wealth. The author asks the reader, "Are you ready to sacrifice your faith and family for success? Can you?" We are asked to look around at our family, loved ones, and faith, and ponder the question, "If I was rich beyond my dreams, and they were not with me, would I truly be happy?" We are not told how to live, but how to live well, which in turn leads to success. When reading the book, readers find themselves looking inwardly at their dreams and goals which become defined and distinguished. The reader is taken on an exploration to discover how to be happy, both internally and externally, without losing what one holds most dear - family and faith in a higher power. What makes the book so distinctive and appealing is how the author emphasizes a sense of self worth entwined with family, faith, and relationships with others, which must be put into perspective before achieving financial success. Charles invites the reader, after self examination, to use his ten important success principles and twelve qualities of successful people. Not only are these tools essential to be successful in business, but essential for what life throws at us. What makes this book unique and engaging is how it shakes off the stereotypes of what it means to be successful. We all have the courage within us to be successful once we unlearn what society has taught us. The author teaches us that family, faith, and community spirit, are important keys to becoming successful, and as a result, happy. The book is inspirational because it teaches us that success may not be what has been taught to us: "Only extreme wealth will make us happy and fulfilled." We are asked, "Are you prepared to give up family, faith, and community spirit to be successful?" If so, will you be happy? The author teaches us that "yes," to be successful, there will be sacrifices, but it does not have to be those we hold most dear. I highly recommend this book to those interested in achieving financial, spiritual and personal success.